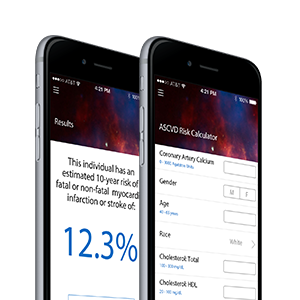 The Astronaut Cardiovascular Health and Risk Modification (Astro-CHARM) calculator is a tool that incorporates traditional risk factor information with coronary artery calcium (CAC) score results to provide an individual’s estimated 10-year risk of atherosclerotic disease (ASCVD) events, including fatal or non-fatal heart attack or stroke. It is intended for use in younger individuals (ages 40-65) without a prior history of ASCVD. The Astro-CHARM was developed using data from three large, population-based cohorts (the Multi-Ethnic Study of Atherosclerosis, Dallas Heart Study, and Prospective Army Coronary Calcium Project), and validated in a fourth cohort (the Framingham Heart Study). Development of the Astro-CHARM was supported by the National Space Biomedical Research Institute (NSBRI) in collaboration with a research group led by Dr. Amit Khera from UT Southwestern Medical Center.